Sauté the celery, carrots, and onions in 1/4 cup Olive Oil (Arbequina, Hojiblanca, etc.) until they begin to color. Then add 3 cups Pinot Noir Wine Vinegar or Apple Cider Vinegar, 2 cups of water, 1/2 cup coarsely chopped parsley, 3 bay leaves, 1 Tbsp each: thyme, basil, cloves, allspice berries and crushed peppercorns, a pinch of mace, 6 crushed cloves of garlic. Bring marinade to a boil and then simmer it for 1 hour. Strain and cool (important). Cut the rabbit into pieces by severing the legs at the joints and cutting the back into 3 sections. Place the pieces into a crock or plastic container. Pour the cooled marinade over the meat and refrigerate for 24-48 hours. Drain and reserve the marinade. Preheat oven to 350 degrees. Dry the pieces of rabbit, then dredge them with flour. Brown until golden in 3 Tbsp. bacon drippings. Remove the browned rabbit to an ovenproof casserole such as a cast iron Dutch oven. Using the same pan the rabbit was browned in, sauté 1 cup thinly sliced onions in 2 Tbsp. Butter Olive Oil. Add the sautéed onions to the Dutch oven casserole with the rabbit. Pour in the marinade from the rabbit and bring to a boil on the stove. Cover the casserole and place in oven for approximately 1-1/2 hours or until tender. 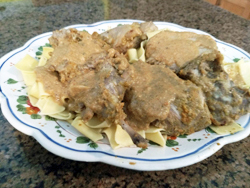 Place rabbit pieces on a serving dish and keep warm in a very low oven until the gravy is made and the noodles are cooked.